2- A fortune teller offers to refund your money. 3- Your twin sister forgets your birthday. One way to get a perspective when your day isn't going so well is to realize that your circumstances may not be so bad after all when compared to someone else's. In fact, sometimes, in comparison, your day will look pretty darned good. —a whale-feces researcher: O.K. How do they even collect this stuff? —Olympic drug tester: testing urine samples thousands of times can't be much fun for anyone, even if it is a specimen from a gold medal winner. —a gravity research subject: while it may be nice to stay in bed for a period of time, doing so until your muscles atrophy is another can't-be-much-fun job. — garbologist: I never knew there was such a thing but considering that I call myself a "jollytologist", I guess there is an "oloigst" for everything. This one sifts through garbage in order to discover how waste breaks down and to analyze consumption patterns. Sorry folks, I'd rather be a jollytologist. —hazardous-materials diver: if you like swimming in sewage, this may be the job for you. Me? I'd rather swim with the sharks. complaining about things like traffic jams, copier jams, or being in a jam, remember the penguin.The male penguin, as seen in the movie, The March of the Penguins, stands all winter huddled together in below freezing temperature and blizzard conditions. Now, don't you feel a lot better not having to do that? "Avoid humorless people-and do not marry one, for God's sake." Most people, I am guessing, think of love as serious. Yet, when women were asked what they wanted in a potential mate, one of the most important things was that the man had to have a good sense of humor. Maybe it is because women intuitively know that couples who can laugh together can weather the trials and tribulations that life inevitably brings. I know one couple, for example, who hide red sponge-rubber clown noses around the house. When an argument breaks out, one of them dons the nose and, like a red-light at an intersection, the potential fight is stopped in its tracks. A friend of mine, who is a therapist, also told me how she uses another fun prop with some couples in conflict. Recently, a woman complained about how insensitive her husband was. For nearly an entire session she harped on his saying there was lint in her belly-button when they were making love the previous night. To help the woman let go and lighten up about this incident, the therapist asked both of them to don Groucho glasses and resume their lint-filled conversation. As soon as the giggling started, the complaining stopped. And finally, a colleague of mine, sent me an amusing story, which illustrates how a little humor can make a big point. Although this married couple enjoyed their new fishing boat together, it was the husband who was behind the wheel operating the boat. He was concerned about what might happen in an emergency. So one day, out on the lake he said to his wife, "Please take the wheel, dear. Pretend that I am having a heart attack. You must get the boat safely to shore and dock it." So she drove the boat to shore and safely docked it. 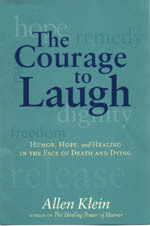 While I was writing my book, The Courage to Laugh: Humor, Hope and Healing in the Face of Death and Dying, my dad died. New Year's Eve 1996, he was taken to the hospital. Nine days later, just hours after my mom called to tell me that he was looking better, my dad was no longer alive. After a frantic phone call to book a flight and only two hours of sleep, I got on a plane that took me from my California home to my mom's condo in Florida and to the funeral. I managed to hold back my tears until I was on the plane. There, however, amidst business men using telephones and the click of laptops, I sat sobbing. “What is it?,” I asked. “Coffee and Bailey's Irish Creme,” he said. That's when my tears mingled with laughter. First of all, it was seven o'clock in the morning—not exactly cocktail hour. Second, I laughed because I never drink coffee and, since I am lactose intolerant, I avoid dairy products—especially cream. I refused the attendant’s grief-relief remedy but there was something special about it anyway. The comic irony of it all made me laugh—not a laugh big enough to completely stop the tears but an inner laugh that felt comfortable and whispered that everything would be all right. Then I had another cosmic chuckle. I realized that I was just handed the opening words for my book. During the next few days, I cried a lot. I was feeling alone and very vulnerable. My mother kept saying not to cry but I allowed my tears to flow. I also noticed that in spite of the sadness of the situation, amusing incidents happened anyway. These drew me away from my tears and produced everything from a smile to a hearty guffaw. My brother and I immediately convulsed with laughter. My mom, realizing what she had said, shoved the phone in my hand. She was laughing too hard to speak. For the next few days, as I was going through this roller coaster ride of tears and laughter, I learned several things about humor and grief. I learned that it may take some time to find laughter after a loss. I learned too that it may not always be the fall-down-hold-your-belly kind of laughter that we had experienced when my mom got tongue-tied. Sometimes it’s only an inner chuckle. But whatever kind it is, it is there. It is there to provide a momentary respite from our grief. It is there to show us that indeed life goes on in spite of our loss. It is there to give us hope. If you have lost someone dear to you recently, I will not tell you to read this book because, as the flight attendant told me, “I guarantee it will help.” No one can guarantee an instant grief remedy; I don't think there is one. What I can say from my own experience, however, is that humor might help. Maybe it will give you hope to continue and a much needed respite from your tears. When a family is sitting Shivah, it is customary for condolence callers to bring food into the home so that the bereaved do not have to cook or prepare meals. While there, remembrances of the deceased are frequently discussed. Often it encompasses some lighthearted moments in the deceased's life. Like the food that the condolence callers bring to provide nourishment for the body, I believe that the things they laugh about provide nourishment for the soul. "When one had understanding, one should laugh; One should not weep. " "Laughter," wrote one author, "is breaking through the intellectual barrier; at the moment of laughing something is understood." Zen humor does exactly that. Whether it be a Zen koan, one of those questions which the rational mind cannot solve, or, a captivating Zen story, when we laugh at these, we go from a chuckle"ha-ha" to comprehension"ah-ha!" Ikkyu, the Zen master, was very clever even as a boy. His teacher had a precious teacup, a rare antique. Ikkyu happened to break this cup and was greatly perplexed. Hearing the footsteps of his teacher, he held the pieces of the cup behind him. When the master appeared, Ikkyu asked, "Why do people have to die?" Ikkyu, producing the shattered cup, added, "It was time for your cup to die." There was once a man who was crossing a field and met a tiger. Running, he came to a great cliff and caught hold of a root and swung over the edge of the cliff. But at the bottom of the cliff was another tiger. Soon two little mice came along and began to gnaw on the vine. The man looked in terror at the tiger below. But then he saw a strawberry vine. He picked the strawberry and ate it. "Ah, how delicious it is," he said to himself. While the fool hits the point. He burst out in hearty laughter. When disaster strikes, shock sets in. When shock sets in, humor takes a back seat. When shock subsides, humor appears again. Not that funny, but still, it was humor, nevertheless. It was a reminder that life, and laughter, go on. Even though it was hard to imagine anything funny ever again, comedians such as Jay Leno and David Letterman returned from their hiatus. But it was hardly humor as usual. Realizing, too, the need for distraction, New York City Mayor Rudy Giuliani commanded the hit Broadway comedy “The Producers” to ring up its curtain again. “Yes, but I'm still going to go,” the man replies. In the Jewish religion, the basic mourning period is the seven days of Shiva. At the end of that you're required to attempt to re-engage with the world and your life as it was. . . .and that's where we come in. While the country was numb and uncertain of what would happen next, humor was dormant. But as we began to get a sense of who our enemy was, humor started to show more strength. Like someone who has had a stroke and must learn to use their body again, we fumbled around with humor until we discovered when to laugh and what to laugh at. It took a while but stand-up comics, late-night comedians and political cartoonists finally found ways to both reflect bad news connected to 9/11 and, at the same time, deflect it with humor. What was safe to satirize was humor directed at our enemies—Osama bin Laden, the terrorists, and the Taliban and everything directly or indirectly related to them. It was a humor that gave us power over our enemy. It was humor which lifted us from our despair. It was also humor that bonded us together against a common cause. “For the record, I did not contact the Taliban. They, in fact, contacted me. What happened was this. I had a hang-up on my machine. So I star-69'd.And they said, 'Hello? 'And I said, 'Who's this? 'And they said, 'Who's this? 'And I said, 'You called me. 'Then they said, 'No, you called us. 'And I said, 'I star-69'd you.'" The New Yorker, which was denuded of cartoons immediately after 9/11, ran a piece two months later comparing what was funny when this country found itself at war in December, 1941, and what we were laughing at now. Two of the current cartoons focused on security issues. The art of the clown is more profound than we think. . . . It is the comic mirror of tragedy and the tragic mirror of comedy. Our comedians and cartoonists are not the only ones who help us heal with laughter. There is a whole other, often under-recognized, group of humor healers. These are the caring clowns around the country who visit hospitals and nursing homes bringing comfort and comic relief to both the sick and the dying. They also play an important role during disasters. “I'm not allowed to get anywhere near the World Trade Center, but I am entertaining the Search and Rescue teams at night. . . . Most of what I've been doing is just being there for the people looking for missing friends, talking with children and entertaining on a limited basis for the people of NYC. This is not a time for jokes and laughter but a time for caring and support. . . . I am doing whatever I can do to help out, even if it is from afar. On TV, the mayor said they don't want unnecessary people being in NYC. I respect him, but I am going by what the New York Police Department, Fire Department and the searchers have been telling me. 'You're a spark of light to us.'. . . .
Security has increased over the past two days and I am limited in my activities and places that I can go—the morgue, Canal Street, and the hospitals all have people who need love, hugs, and understanding. . . . I hold hands and hug people. It's easy to hug a clown. I spend a lot of time talking to the police, well listening. I give out hug coupons. Sometimes the police see me and ask for more hug coupons so they can give them out. When they see me, they start laughing. A lot of the police want their pictures taken with me. And they want the senior officer to hug a clown and have their picture taken. . . . I met Mayor Giuliani and the governor and all they could say was 'Thanks for being here, you are what we need right now.' Clowns do make a difference and I have the memories to prove it. The comic spirit masquerades in all things we say and do. We are each a clown and do not need to put on a white face. Sometimes, when we least expect it, the comic spirit arises, from seemingly out of nowhere, to remind us that there just might be another way of looking at a troubled world. I've been volunteering at the Armory. That is where the families with missing people go. . . . I was sorting through the donations people were sending in. One woman sent a mink coat. Someone sent dirty sneakers, T-shirts with armpit stains, and, let's see what else—oh, yes, half a tube of toothpaste! Everyone in my part of the Armory was laughing hysterically when they saw these items. It was kind of nice to have something to laugh at. . . . Yesterday we went back to work—tried to be normal. I was walking home and had stopped at a light near my apartment. I noticed the guy standing next to me was wearing a New York City fire department T-shirt. I thanked him and asked him how he was holding up. He started sobbing and hugged me. I went to the firehouse with him and lit a candle at the vigil. As I was walking back to my house, I kept wondering if NYC would ever be the same again. I think the comedian's greatest service in the upcoming months can be to remind people of the past tragedy—but at the same time nudge them toward normalcy with laughter. The comedians, the cartoonists, and the caring clowns comforted a nation under stress. They provided a distraction from the seemingly endless replay of the horrors of September 11th. The laughter they helped produce bonded us together in defiance. One doctored photograph, for example, of a supposedly new design for the World Trade Center showed not two towers, but five. Each looked like a finger, the middle one sticking up higher than the rest. Back to normal? Sort of. "To the memory of those who made us laugh: to the motley mountebanks, the clowns, buffoons, in all times and in all nations, whose efforts have lightened our burden a little. Within hours of the Chernobyl nuclear-power disaster, the Challenger shuttle explosion, and even the 1993 bombing of the World Trade Center, tasteless jokes, often dubbed “gallows humor,” spread like wildfire. But the day the terrorists' attacked the World Trade Center and the Pentagon, humor, for the most part, stopped. The country, no, the world, was in mourning. Unlike Chernobyl, the terrorists' attacks weren't something that happened in some far away place. It happened right here in the US and was the worst disaster in our history. Unlike the Challenger explosion, where seven people lost their lives, almost 3,000 thousand people died on 9/11. And, unlike the earlier bombing on the World Trade Center, a major landmark and symbol of the strength of the financial world was, not just damaged but, totally destroyed. The gallows humor of previous disasters, no matter how tasteless, provided an outlet for people to vent their feelings. But too many people were too close to the senseless attacks of September eleventh, and the repercussions too widespread, to joke about it. Our sense of safety, for anyone everywhere, was threatened forever. and you don't want to read it. Comedians and cartoonists around the country grappled with the appropriateness of humor at this tragic time. Shows like “Late Show With David Letterman”, the "Late Late Show With Craig Kilborn” and the “Tonight Show With Jay Leno” suspended operations. Any attempts at humor immediately after September 11th were deemed tasteless. The internet, where one would usually find gallows humor, was devoid of it. At the same time, dozens of humor lists delayed their Web postings. And jokes, which get passed around the internet on an hourly basis, ceased. Magazines suspended humor too. The New Yorker, known for its witty cartoons and playful covers, had a dark gray and black cover and no cartoons. It was the first time since Hiroshima that the magazine was void of any humorous drawings. For the creators of comedy, there was a nagging question: When nobody feels like laughing, what do humorists do? Will We Ever Laugh Again? To every thing there is a season, and a time to every purpose under heaven. A time to be born, and a time to die . . . . A time to weep, and a time to laugh. Two days after the attacks, I was scheduled to present one of my humor programs for an organization in Missouri. However, it, and my flights to get there, were canceled. But a scheduled program in Las Vegas the following week was not. I wrestled with how to handle what I would say to the audience. I questioned whether or not to discuss the events of the previous week. Whether it was too soon for laughter? How might the audience react? In light of the recent death and destruction, would they think that what I was saying was irrelevant, and, even worse, irreverent? Since the goal of my programs is to show audiences how humor can both help them heal as well as deal with not-so-funny stuff, I decided to discuss the events of the previous week, the pain all of us were feeling, and how humor and some laughter might be beneficial. I cut out a couple of airline stories that I knew would get a laugh because I also knew that any reference to air travel just then might make the audience nervous. So rather than risk it, I dropped the airlines anecdotes. Other than that, I proceeded with my usual humor program. Shobi reminds us, “Everyone needs a different amount of time to adjust.” Some may do it in three days, some three weeks, and some three months. For others, three years may not even be enough time. That's Not Funny. . . or is it? but like any gift, it can abused. It was a strange time for cartoonists, comedians and the country. But, in spite of the President's urging to get back to normal, comedians who attempted to cheer the public up too soon were put down. “Comedy is at a weird point right now,” Kevin McGeehan, a member of the legendary Second City comedy troupe, told one reporter. “Nobody’s sure what’s funny anymore. There's been a very weird vibe since the attacks, where anything a comedian says can be misconstrued.” And it was. Almost a week after the attacks Politically Incorrect host, Bill Maher, was reprimanded, by both his sponsors and White House, for a remark he jokingly made about U. S. bombing tactics. Had Maher waited another week instead of a mere six days after the attack, noted one reporter, there would not have been such a fuss about his remark. But our wounds were too raw, our grief too new to laugh. In another example of too much humor too soon, a couple of radio disk-jockeys were fired for playing a parody of the calypso banana boat song Day O. The lyrics, as evidenced below, were not really offensive to anyone, except maybe the Taliban. But their boss obviously felt otherwise. Hey Mr. Taliban, hand over bin Laden. Daylight come and we drop de bombs. Cruise missiles knocking at your door. Finding humor in a tragic situation is an extremely healthy step. It is a way of looking toward the future and of saying that this suffering can be put behind us. In The Sandusky (Ohio) Register. columnist Dave Schwensen likened the September 11th attacks to getting beat up by a bully. 1. All major sports teams have coaches. If you want to play in the major league, get coaching. 2- If you want to be good, hang around those who already are. 3- Audiences remember only a few of your words. They never forget the essence of who you are. 4- Work on who you are more than what you say. 5- Don't rush to get your book published. People eventually forget a bad speech. A book is forever. 6- Professional speaking is a crazy business but that doesn't mean that you need to go crazy. Don't go bonkers, if you lose a speaking engagement. It leaves that date open for another one to come along...or to write the next bestseller. 7- Charge less than you are worth and grow into your fee. 8- Don't try to do it all. Everything you hear from other speakers shouldn't be everything you do. Take only what fits for you, your style, and your market. 9- Have a passion for what you do. It will help you get through those delayed flights, canceled engagements, and not-so-great audiences. 1- Being Committed: They were determined to get more laughter in their life. 2- Making the Right Choice: They knew they have a choice: They can be miserable or mirthful. 3- Staying in Control: They recognized that nobody or nothing can ruin their day. 4- Reframing Experience: They turn adverse situations around by finding something funny in them. 5- Looking for the Light Side: They were always on the lookout for the lighter side of a situation. 6- Laughing at Themselves: They found it easy to laugh at themselves. 7- Laughing Even When It’s Hard: They laughed even when finding something to laugh about was elusive. Cancer, schmancer—as long as you're healthy. In my humor and healing presentations, I do an exercise with red clown noses. Everyone in the audience gets a sealed packet with one inside. With their eyes closed, I ask audience members to think of some difficulty they are having and then, still with their eyes closed, to open the packet and put on the clown nose. Then I ask them to open their eyes and look around the room. I was a little reluctant to do this activity, however, when I addressed the annual meeting of the National Coalition of Cancer Survivorship. I knew that a number of people in the group had facial cancer. Some had only a partial nose, some none at all. I checked with the meeting planner to make sure that the clown-nose-process was appropriate. She assured me that even those with facial disfigurement would love it. Still, I was uncomfortable about doing it. My fears were quickly alleviated, however, when the group not only responded with overwhelming laughter but also delighted in sharing stories with me about their prosthetic noses. One woman joyfully showed me a Polaroid photo taken in her hotel room minutes before my speech. She told me that she was getting ready to attend my talk and proceeded to put adhesive glue on her prosthetic nose. Then she waited for it to dry. When it came time to attach the nose, however, it was gone. She could not find it. At that moment a friend knocked on the door. So she asked her friend to help locate it. The nose was finally found and a picture taken. It showed the nose stuck to her rear-end. Serious illnesses, like cancer, are not funny. Still, funny things happen.